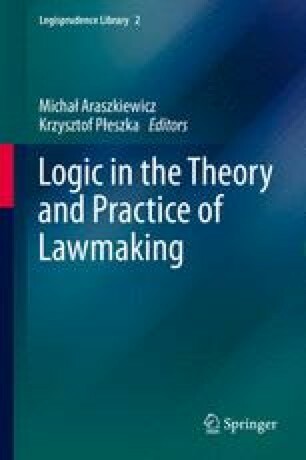 The article analyses the possibility of applying immune-like processing of legal texts in the legislative process. It also discusses the required format for recording legal information and the relationships between the formats for recording legal information and the methods used to analyse it. On this ground we argue that the formal analysis of a legal text must extend beyond its logical consistency. This is so due to the fact that the quality of legislation depends not only on the lack of internal contradictions within a legal text but also on the number of requirements a legal text has to meet. Legislation should not only be consistent but also coherent, uniform and comprehensible. This requires, inter alia, consistent terminology, a lack of redundancy, appropriate references and compliance with the requirements set forth in the principles of legislation . In order to achieve the above-mentioned aims legislators are beginning to apply new tools to complement traditional approaches. As a consequence, legal drafting is nowadays aided by various information and communication technologies usually based on classic editing tools and algorithms for text processing. However, due to deficiencies in already existing solutions it is important to consider using novel, adaptive and specially dedicated algorithms, which would allow for similarity analyses of legal texts and in particular would detect patterns, relationships or coincidences in their content and structure. Such algorithms can be based on computational intelligence, and more specifically on artificial immune systems . As a consequence, the article will discuss both the scope of application and the capacity of tools based upon the idea of natural immune systems as means of increasing the quality of legislation . Ademokun, Alexander A., and Deborah Dunn-Walters. 2010. Immune responses: Primary and secondary. In eLS, Wiley Oline Library. http://onlinelibrary.wiley.com/doi/10.1002/9780470015902.a0000947.pub2/full. Karakose, Mahmet. 2013. Reinforcement learning based artificial immune classifier. The Scientific World Journal. Hindawi. http://downloads.hindawi.com/journals/tswj/2013/581846.pdf. Accessed 15 Jan 2014.